Virat Kohli thrashed 117 runs which enabled India to win the second One Day International against the visiting West Indies besides being given a difficult target. The West Indies scored 269 runs batting first and India chased the target on the first ball of the 49th over. Virat Kohli was declared ‘Player of the match’ awarded to him by his blistering and timely innings which took away the match from the visitors. Earlier the Caribbeans were put in to bat after Virender Sehwag won the toss and they had dreadful start by losing the first wicket at mere three runs. Indian bowlers dominated the innings from the word go and the Windies batsmen found it hard to collect the runs. Lendl Simmons was the only batsman who resisted with positive response and fought well throughout his innings. They had lost five wickets for 63 runs and had just one reasonable partnership with Kieron Pollard of 56 runs for the sixth wicket. Simmons played well until he was removed as India claimed ninth wicket at 170 runs not before he had scored 78 runs scored off 102 balls which consisted one six and eight fours. Ravi Rampaul came in and swept the Hosts bowling like a storm while creating individual record of highest score by a no.10 batsman in the limited over cricket. He punished Indian attack at will which looked ordinary as long as the Windies innings continued. The 27-year-old blasted unbeaten 86 runs while facing 66 balls with the help of 6 sixes and 6 fours as his partner Kemar roach gave him ideal support of 24 runs. West Indies were placed well after scoring 269 runs for the loss of nine wickets by the end of the 50th over. Umesh Yadav was the highest wicket taker for India with three, Vinay Kumar and Jadeja shared two as Ashwin claimed one wicket. India started their innings in an identical fashion of the visitors by losing their first wicket at three runs. Gautam Ghambir was the next batsman to follow after contributing 12 runs when 26 runs were added to the total. Virat Kohli stepped in to replace Ghambir as Sehwag was doing his best to negotiate with the alarming spell by the rival bowlers. Kohli started his innings cautiously but changed his gears later on and did not let the bowlers rule over him by dispatching two fours in the 10th over to Roach and continued with aggression later on. India faced another blow when Sehwag was caught by Andre Russell off Marlon Samuels for 26 runs. The third wicket fell at 84 runs in 16.3 overs and it was time for young Rohit Sharma to take guards in the center who belled the ring with a towering six over deep mid wicket to Rampaul in the 18th over. They consolidated the innings with authority while Darren Sammy used seven bowlers to dislodge the partnership. 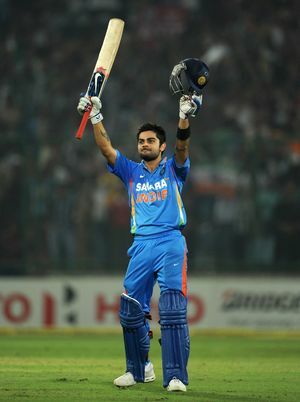 Kohli completed his 8th century in ODI by taking a single on the fifth ball of the 42nd over. The duo shared a match winning partnership of 163 runs for the fourth wicket before Kohli was gone after thrashing 117 runs off 123 balls with 14 fours. Sharma and Ravindra Jadeja saw India through to the victory by achieving a total of 270 runs with 11 balls to spare. Sharma remained unbeaten on 90 runs off 98 balls aided with two sixes and seven fours as Jadeja supported him on nine runs. Rampaul and Roach shared the honors for the Windies with two wickets each as Samuels had one scalp. India won the match easily at the end by five wickets and is leading the five match series 2-0.